“Vintage” has long been a theme obsessed over by the fashion world, but recently has made a huge re-emergence in other areas such as music, television, photography and marketing campaigns. Popularized songstresses’ like Lana del Rey, Adele and the late Amy Winehouse all had multiple chart toppers utilizing their style of breathy, antiqued sound. In television, shows like Mad Men and Boardwalk Empire have inspired specialty lines in stores like Banana Republic, red-lipped make-up for Estee Lauder and dolls for Barbie. The younger generation has even shown their interest by wearing the thick-rimmed glasses known as “Horn Rim” glasses as seen on many of these shows. They have been popularized so much that “Hipsters” all over have made it their trademark. The popular app, Instagram has made it a hit to over expose your photos and add vinegette touches to give the shot a dated and classic look. 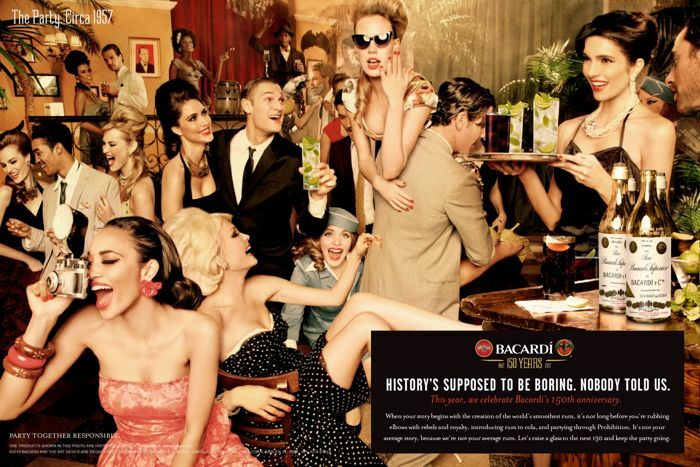 Even liquor companies have jumped on the bandwagon of the “blast from the past.” Bacardi recently took a photo shoot celebrating their 150 years and turned it into a commercial, where cocktail waitresses and partygoers alike are dressed in ‘50s glam. It’s impossible to deny that this trend is here to stay for a while. Therefore, we suggest hitting up your local thrift store or your parents closet to dig out some of the classics. This entry was posted in Voice of Project Ethos on August 2, 2012 by projectethos.